^ Somerset 2012, pp. 532–535. ^ Szechi 1994, p. 91. ^ Szechi 1994, pp. 93–95. ^ Dickson 1895, p. 273. ^ Blaikie 1916, p. xlix. ^ McKay 1983, pp. 138–140. ^ Zimmerman 2003, p. 133. ^ Groves 2017, pp. 3–4. ^ Riding 2016, p. 337. ^ Szechi 1994, pp. 94–95. ^ Riding 2016, pp. 19–20. ^ Zimmerman 2003, p. 51. ^ Riding 2016, p. 20. ^ Szechi 1994, pp. 96–98. ^ Harris 2006, pp. 439–444. ^ a b Stephen 2010, pp. 55–58. ^ a b Shinsuke 2013, p. 37 passim. ^ Somerset 2012, p. 166. ^ Lord 2004, pp. 131–136. ^ Monod 1993, pp. 197–199. ^ Riding 2016, pp. 234–235. ^ Strong 2002, p. 15. ^ a b Szechi & Sankey 2001, pp. 90–128. ^ Cruikshanks 2008, pp. 96–97. ^ Corp 2014, p. 29. ^ Stephen 2010, p. 49. ^ Harding 2013, p. 171. ^ a b Bromley 1987, p. 233. ^ a b Duffy 2003, p. 43. ^ Riding 2016, p. 27. ^ Fremont 2011, p. 48. ^ Riding 2016, p. 29. ^ Murray 1898, p. 93. ^ Riding 2016, pp. 55–56. ^ Riding 2016, pp. 57–58. ^ Graham 2014, p. 2. ^ Riding 2016, pp. 83–84. ^ Stewart 2001, pp. 152–153. ^ Riding 2016, pp. 465–467. ^ McCann 1963, p. 13. ^ Riding 2016, pp. 123–125. ^ Riding 2016, pp. 93–94. ^ Riding 2016, pp. 95–97. ^ Duffy 2003, p. 198. ^ Riding 2016, p. 195. ^ Pittock 2016, p. 26. ^ Hopkins 1998, p. 1. ^ Riding 2016, p. 185. ^ Elcho 2010, p. 289. ^ Wemyss 2003, p. 81. ^ Riding 2016, pp. 175–176. ^ Riding 2016, p. 199. ^ Wemyss 2003, p. 85. ^ Stephen 2010, pp. 60–61. ^ Riding 2016, pp. 200–201. ^ Duffy 2003, p. 223. ^ a b Riding 2016, pp. 209–216. ^ Riding 2016, pp. 298–299. ^ Pittock 1998, p. 115. ^ a b Pittock 2004. ^ Riding 2016, pp. 299–300. ^ Riding 2016, pp. 304–305. ^ Stephen 2010, p. 63. ^ Colley 2009, pp. 72–79. ^ Riding 2016, p. 354. ^ Elcho 2010, p. 201. ^ Riding 2016, pp. 328–329. ^ Chambers 2018, pp. 329–333. ^ Chambers 2018, pp. 353–354. ^ Riding 2016, pp. 377–378. ^ Pittock 2016, pp. 58–98 passim. ^ Reid 1996, p. 9. ^ Gold & Gold 2007, pp. 11–12. ^ Royle 2016, p. 87. ^ Riding 2016, p. 427. ^ Elcho 2010, p. 207. ^ Riding 2016, p. 493. ^ Roberts 2002, pp. 196–197. ^ Lewis 1977, pp. 287–288. ^ Quynn 1941, pp. 236–258. ^ Lenman 1980, p. 27. ^ Higgins 2014, p. 138. ^ Seymour 1980, pp. 4–9. ^ Devine 1994, p. 16. ^ Szechi 1994, p. 133. ^ McLynn 1980, pp. 177–181. ^ Riding 2016, pp. 496–497. ^ Zimmerman 2003, p. 273. ^ Blaikie 1916, p. Ixxxvi. ^ Duke 1927, p. 66. ^ Pittock 2016, p. 135. ^ Aikman 2001, p. 93. ^ Devine 1994, p. 2. ^ Mackillop 1995, p. 2. ^ Mackillop 1995, pp. 103–148. ^ Streets 2010, p. 52. ^ Buchan 2003, p. 311. ^ Royle 2016, p. 25. ^ Kidd 1997, pp. 86–102. ^ Mearns 2007, p. 69. ^ Sroka 1980, pp. 140–162. ^ Morris 1992, pp. 37–39. "The '45 in Northumberland and Durham". The Northumbrian Jacobite Society. Archived from the original on 9 October 2015. Retrieved 13 April 2018. Aikman, Christian (2001). No Quarter Given: The Muster Roll of Prince Charles Edward Stuart's Army, 1745–46 (third revised ed.). Neil Wilson Publishing. ISBN 978-1903238028. 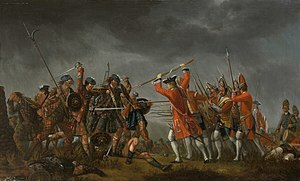 "The Battle of Culloden". British Battles. Retrieved 16 November 2018. Blaikie, Walter Biggar (1916). Origins of the 'Forty-Five, and Other Papers Relating to That Rising. T. and A. Constable at the Edinburgh University Press for the Scottish History Society. OCLC 2974999 – via Internet Archive. Bromley, J. S. (1987). Corsairs and Navies, 1600–1760. Hambledon Press. ISBN 978-0907628774. Buchan, James (2003). Crowded with Genius: The Scottish Enlightenment: Edinburgh's Moment of the Mind. HarperCollins. ISBN 978-0060558888. Campsie, Alison (31 October 2017). "Myth Buster: Was Tartan Really Banned After Culloden?". The Scotsman. Archived from the original on 21 November 2017. Retrieved 7 November 2018. Chambers, Robert (2018) . History of the Rebellion of 1745–6. Forgotten Books. ISBN 978-1333574420. Colley, Linda (2009). Britons: Forging the Nation 1707–1837 (Third ed.). Yale University Press. ISBN 978-0300152807. Corp, Edward (2014). 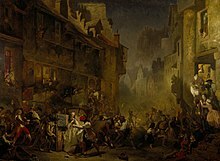 "The Scottish Jacobite Community at Saint-Germain after the Departure of the Stuart Court". In Macinnes, Allan I.; German, Kieran; Graham, Lesley. Living with Jacobitism, 1690–1788: The Three Kingdoms and Beyond. Pickering & Chatto. pp. 27–38. ISBN 978-1848934702. Cruikshanks, Lauchlin Alexander (2008). The Act of Union: Death or Reprieve for the Highlands?. Wesleyan University. pp. 96–97. OCLC 705142720. Devine, T. M. (1994). Clanship to Crofters' War: The Social Transformation of the Scottish Highlands. Manchester University Press. ISBN 978-0719034824. Dickson, William Kirk, ed. (1895). The Jacobite Attempt of 1719: Letters of James Butler, second Duke of Ormonde. T. and A. Constable at the Edinburgh University Press for the Scottish History Society. OCLC 652345728 – via Internet Archive. Duffy, Christopher (2003). 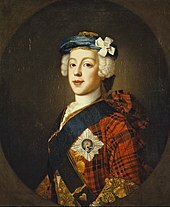 The '45: Bonnie Prince Charlie and the Untold Story of the Jacobite Rising (First ed.). Orion. ISBN 978-0304355259. Duke, Winifred (1927). Lord George Murray and the Forty-five (First ed.). Milne & Hutchison. Elcho, David (2010) . A Short Account of the Affairs of Scotland in the Years 1744–46. Kessinger Publishing. ISBN 978-1163535240. Fremont, Gregory (2011). 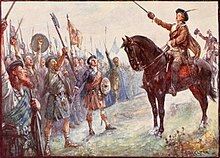 The Jacobite Rebellion 1745–46. Osprey Publishing. ISBN 978-1846039928. Gold, John R; Gold, Margaret M (2007). "'The Graves of the Gallant Highlanders': Memory, Interpretation and Narratives of Culloden". History and Memory. 19 (1): 11–12. doi:10.2979/his.2007.19.1.5. Graham, Roderick (2014). 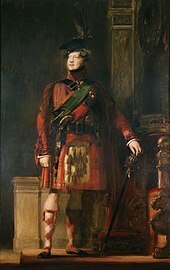 Bonnie Prince Charlie: Truth or Lies. Saint Andrew Press. ISBN 978-0861537839. Groves, Percy (2017) . History Of The 42nd Royal Highlanders: The Black Watch, Now The First Battalion The Black Watch (Royal Highlanders) 1729–1893. W. & A. K. Johnston. ISBN 978-1376269482. Harding, Richard (2013). The Emergence of Britain's Global Naval Supremacy: The War of 1739–1748. Boydell Press. ISBN 978-1843838234. Harris, Tim (2006). Revolution: the Great Crisis of the British Monarchy 1685–1720. Penguin. ISBN 978-0141016528. Higgins, Charlotte (2014). Under Another Sky: Journeys in Roman Britain. Random House Vintage Books. ISBN 978-0099552093. Hopkins, Paul (1998). Glencoe and the end of the Highland Wars. John Donald Publishers Ltd. ISBN 0859764907. "The Inventory of Historic Battlefields – Battle of Culloden" (PDF). Historic Scotland（英語版）. Retrieved 16 November 2018. "Jacobite Stories: the Battle of Culloden". National Trust for Scotland. 22 February 2017. Retrieved 19 December 2018. Kidd, Colin (April 1997). "'The Strange Death of Scottish History' Revisited: Constructions of the Past in Scotland, c. 1790–1914". Scottish Historical Review. lxxvi (100): 86–102. JSTOR 25530740. Kidd, Colin (November 2013). "From Jacobitism to the SNP: the Crown, the Union and the Scottish Question" (PDF) (The Stenton Lecture). Archived (PDF) from the original on 25 March 2017. Retrieved 14 April 2018. Lenman, Bruce (1980). The Jacobite Risings in Britain 1689–1746. Methuen Publishing. ISBN 978-0413396501. Lewis, William (1977). Horace Walpole's Correspondence; Volume 19. Yale University Press. ISBN 978-0300007039. Lord, Evelyn (2004). The Stuarts' Secret Army: English Jacobites, 1689–1752. Pearson. ISBN 978-0582772564. Mackillop, Andrew (1995). Military Recruiting in the Scottish Highlands 1739–1815: the Political, Social and Economic Context. PHD Thesis University of Glasgow. OCLC 59608677. McCann, Jean E (1963). The Organisation of the Jacobite Army. PHD thesis Edinburgh University. OCLC 646764870. Retrieved 15 November 2018. McKay, Derek (1983). The Rise of the Great Powers 1648–1815 (First ed.). Routledge. ISBN 978-0582485549. McLynn, Frank (October 1980). "An Eighteenth-Century Scots Republic? An Unlikely Project from Absolutist France". The Scottish Historical Review. 59 (168): 177–181. JSTOR 25529380. Mearns, Alasdair B. (2007). “Catriona Nic Fhearghais (Christiana Fergusson)”. The Biographical Dictionary of Scottish Women. Edinburgh University Press. ISBN 978-0748632930. Monod, Paul Kleber (1993). Jacobitism and the English People, 1688–1788. Cambridge University Press. ISBN 978-0521447935. Morris, R. J. (1992). "Victorian Values in Scotland & England" (PDF). In Smout, T. C. Victorian Values. Proceedings of the British Academy. 78. ISBN 978-0197261194. Mudie, Robert. "Historical Account of His Majesty's Visit to Scotland, Edinburgh, 1822". National Library of Scotland. Archived from the original on 12 September 2014. Retrieved 7 November 2018. Murray, John (1898). Bell, Robert Fitzroy, ed. Memorials of John Murray of Broughton: Sometime Secretary to Prince Charles Edward, 1740-1747. T. and A. Constable at the Edinburgh University Press for the Scottish History Society. OCLC 879747289 – via Internet Archive. Pittock, Murray (1998). Jacobitism. Palgrave Macmillan. ISBN 978-0333667989. Pittock, Murray (2016). Great Battles; Culloden (First ed.). Oxford University Press. ISBN 978-0199664078. Quynn, Dorothy Mackay (July 1941). "Flora MacDonald in History". The North Carolina Historical Review. 18 (3): 236–258. JSTOR 23516055. Reid, Stuart (1996). British Redcoat 1740–93. Osprey Publishing. ISBN 978-1855325548. Riding, Jacqueline (2016). Jacobites: A New History of the 45 Rebellion. Bloomsbury. ISBN 978-1408819128. Roberts, John (2002). The Jacobite Wars: Scotland and the Military Campaigns of 1715 and 1745. Edinburgh University Press. ISBN 978-1902930299. Royle, Trevor (2016). Culloden; Scotland's Last Battle and the Forging of the British Empire. Little, Brown. ISBN 978-1408704011. Seymour, W. A. (1980). A History of the Ordnance Survey. Dawson. ISBN 978-0712909792. Shinsuke, Satsuma (2013). Britain and Colonial Maritime War in the Early Eighteenth Century. Boydell Press. ISBN 978-1843838623. Somerset, Anne (2012). Queen Anne; the Politics of Passion. HarperCollins. ISBN 978-0007203765. Sroka, Kenneth M. (January 1980). "Education in Walter Scott's Waverley". Studies in Scottish Literature. 15 (1): 139–162. eISSN 0039-3770. Stephen, Jeffrey (January 2010). "Scottish Nationalism and Stuart Unionism: The Edinburgh Council, 1745". Journal of British Studies. 49 (1, Scotland Special Issue): 47–72. doi:10.1086/644534. JSTOR 27752690. Stewart, James A. Jr. (2001). Highland Motives in the Jacobite Rising of 1745–46: 'Forcing Out,' Traditional Documentation and Gaelic Poetry. Proceedings of the Harvard Celtic Colloquium. 20/21. pp. 152–153. ISBN 978-0674023833. JSTOR 41219594. Streets, Heather (2010). Martial Races: The Military, Race and Masculinity in British Imperial Culture, 1857–1914. Manchester University Press. ISBN 978-0719069635. Strong, Rowan (2002). Episcopalianism in Nineteenth-Century Scotland: Religious Responses to a Modernizing Society. Oxford University Press. ISBN 978-0199249220. Szechi, Daniel (1994). The Jacobites: Britain and Europe, 1688–1788 (First ed.). Manchester University Press. ISBN 978-0719037740. Szechi, Daniel; Sankey, Margaret (November 2001). "Elite Culture and the Decline of Scottish Jacobitism 1716–1745". Past & Present. 173 (173): 90–128. doi:10.1093/past/173.1.90. JSTOR 3600841. Wemyss, Alice (2003). Gibson, John Sibbald, ed. Elcho of the '45. Saltire Society. ISBN 978-0854110803. Zimmerman, Doron (2003). 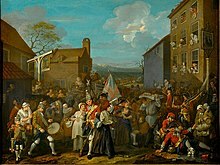 The Jacobite Movement in Scotland and in Exile, 1749–1759. Palgrave Macmillan. ISBN 978-1403912916.